My name is Uwe Weinert from Germany. I would like to tell you today about a meeting I had with Steve after a concert here in Dusseldorf on 04/04/2000. After the show, I have waited 2.5 hours to get this German license plate signed. It is a German tractor license pate from the small town VAIHINGEN. This town has the prefix towncode VAI. I showed him this plate and he said to me: “It´s amazing”. Then he signed it and gave it back to me. He reached into his jacket, took a camera out and made a photo of me with the license plate in my hand. Than, he gave the camera to his roadie, came beside me and the roadie made a photo of Steve and me. Then Steve told me that he will put this photo on his website! It was 2:30 am and very dark, so I think you can see from the license plate only the reflection of the flash. 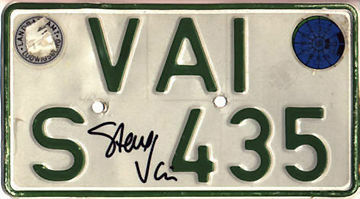 Out of this reason, I send you a scan of this plate and hope you can use it when you put this on his website.